Even fairly early in my needlepoint career I was looking for ways to create interesting effects in needlepoint that would not require much, if any stitching. It lead to some good results (using cross stitch cloth for needlepoint) and some near disasters (waste canvas on a rough cloth). I embraced colored canvas the moment I saw it. I have sponge painted many backgrounds and colored my own canvas. I have stenciled, stamped, dyed, and colored to create backgrounds and designs. I keep looking for new ideas to adapt. I found this goody on the Recycled Crafts blog over at Craft Gossip from The Technique Zone. 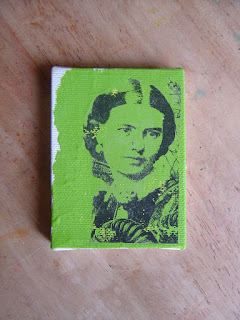 The idea is to transfer images onto an acrylic painted background. In the sample the end result looks like a Monty Python cartoon: a vintage black and white image on color. They show the result of paper and on artist’s canvas. But I think it would work on needlepoint canvas as well. We already use acrylics to paint canvas (this would require a thicker coat). We certainly can find vintage images. This combination could give a very different look to the background of your needlepoint. don’t let your canvas dry on the paper, it will get stuck. Remove the finished canvas as soon as you can by picking it straight up. your image should be clear with few details. Details will get lost in the canvas holes.